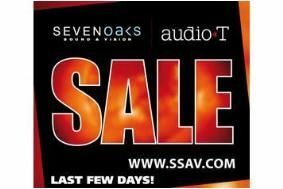 UPDATE: Sevenoaks/Audio T sale extended to August 31st | What Hi-Fi? • Samsung UE40C7000 40in LED 3D TV £1499 (Save £300) + Claim free BD-C6900 3D Blu-ray player and SSG-P2100T 3D starter kit. For these and more final offers, simply head over to the Sevenoaks website.